They say the devil’s in the details, but for me the details are heaven. Maybe an avid planner and host like me should say that in the course of the party I’m on a cloud of joy, but that would be a lie. Planning and preparing are my favorite parts of the process. Truth be told, when it comes to the actual parties, I’m a nervous wreck. But there is a moment of joy. Mine comes when I see the party come together. The guests are flowing through the space, tasting food, trying out any activities, having conversations with friends and strangers. And when I see someone take a bite of dessert, or try out a photo booth costume, or smile as they pick up a favor, well, that makes it all worth it. Creating a party. It’s my favorite thing to do, and I’m inviting you, as my guest, to join me in the festivities. I know we’re going to have fun. Come—discover your inner party planner! 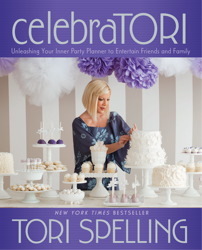 In celebraTORI, bestselling author and party planning maven Tori Spelling makes hosting all your social events look easy. In honor of one of more festive nights of the year – New Year’s Eve – we’re giving away a copy of this super fun guide to being a glowing, warm, and RELAXED hostess. PLUS, we’re throwing in two of Tori’s dishy memoirs, Mommywood and Uncharted TerriTORI. All you have to do is answer this question: what’s YOUR favorite NYE party planning tip? Whatever your idea is, we want to hear it! Be sure to answer the question in a comment below by 9 a.m., Tuesday, December 31, for your chance to win! One winner will be chosen at random. **Click here for complete contest rules. With celebraTORI, Tori Spelling rolls up her sleeves, expertly showing how creativity, passion, and smart planning are the secret ingredients for throwing a truly unforgettable bash on any "real world" budget.